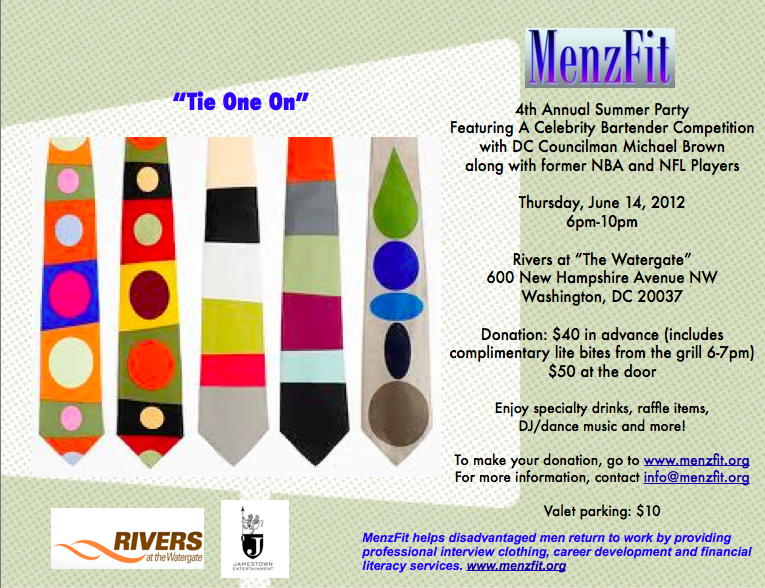 2 Days until MenzFit’s 4th Annual Summer Party, “TIE ONE ON” Featuring “Celebrity Bartenders.” Come out and support an awesome cause and the only of its kind in the Washington, DC area! Join us for an evening of Summer Fun on the Patio at “Rivers at The Watergate,” Thursday, June 14th, 6-10pm. Enjoy complimentary lite bites from the grill (6-7p), specialty drinks, DJ/dance music, raffles, silent auction and more….!! Donation: $40 in advance; $50 at the door. Reserve your space and make your donation at www.menzfit.org. Your attendance and support will go a long way to help low-income men get and keep jobs.